Hastings Writers’ Group is one of the oldest established writers’ groups in the country. Formed in 1947, it began as The Hastings and St Leonards Writers’ Circle, changing its name on its 25th anniversary in 1972. Among the founder members was the then unpublished Catherine Cookson, who was writing her first novel Kate Hannigan, which was published in 1950. 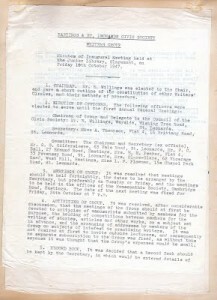 Records show that Catherine Cookson was an active member until 1968. After moving to Northumberland in 1976, she continued to support HWG by sponsoring a competition named in her honour, ‘The Catherine Cookson Cup’ short story competition. She received the OBE in 1985 and was made a Dame in 1993. Hastings Writers’ Group is proud to have had her as a member and as our first Patron. In 1971 a cup was presented to the group to be awarded to ‘The Writer of the Year’. This award is based on a system of points assigned for competitions held throughout the year. The five competitions forming this award continue to be the focus of HWG’s activities. 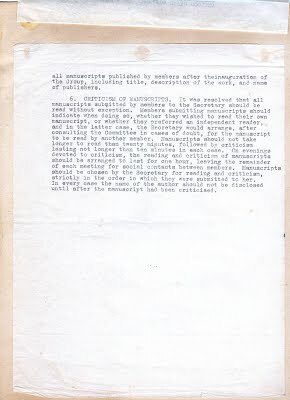 In January 1976 the Manuscript Secretary was Alan Fisher. Alan published five novels, one of which, The Terioki Crossing, won the celebrated ‘Georgette Heyer Award for Historical Fiction’ in 1988. His books were particularly popular in Denmark, much to his surprise. Alan was also a creative writing tutor. In 1988 David Gemmell, a highly successful local author of heroic fantasy and a most entertaining speaker, sponsored an annual short story competition, The David Gemmell Cup, to be run by HWG. Initially for writers in East Sussex, it spread further across the South-East until, in 2001, it developed into a prestigious national competition the Legend Writing Award, named after his first and favourite book. Winning entries were published in a small anthology Six of the Best. In the latter years a Flash Fiction section was included. David judged the competitions from the short-listing stage. HWG continued to run Legend until it was ended in 2010. For several years we also gave 20% of the profits to the Great Ormond Street Hospital Children’s Charity. David became our Patron in 1998. David Gemmell and Alan Fisher discovered they were near neighbours and became close friends. Sadly, David died in 2006. Alan Fisher judged the Legend that year, but unfortunately passed away soon after his friend. Both men gave great support and encouragement to the group and are fondly remembered. There have been and still are many successful writers in the Group. There is not space to list them all, but over the years there have been a number of members who became published authors of novels or non-fiction books, short stories, poems and articles, or who won national competitions and writing awards. Others have had TV or radio plays broadcast. In 2007 we reached our Diamond Anniversary and celebrated this with our first charity anthology: Diamonds – a Collection of Childhood Memories. RNIB Talking Books recorded it for their library. Funds raised from sales paid for member Kate O’Hearn’s successful children’s book Shadow of the Dragon Part 1: Kira to be turned into a talking book for RNIB, and enabled donations to support Demelza House Children’s Hospice, and also Xpress Advocacy Service to help with their magazine for children in care. It is interesting to note the continuity of events since HWG was founded. Competitions, talks, seminars and workshops are all there to encourage aspiring writers. There are records of social events to enable members to meet and chat in a relaxed atmosphere, which we aim to continue today. 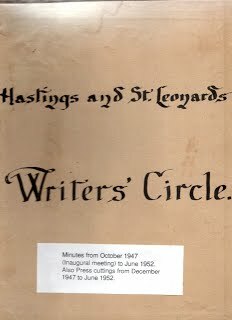 At their first meeting, the founding members recorded that the Group was formed ‘in order to encourage all writers resident in the Hastings area to develop their skills and gain maximum benefit from the support of their fellow members’. It is fair to say that those aims have been achieved and continue to apply to the present day. This year we mark our 70th Anniversary. 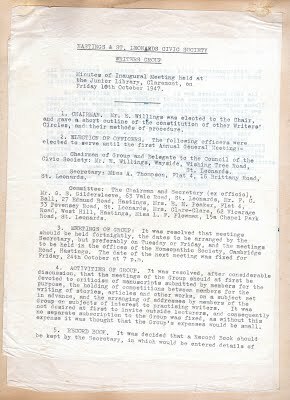 Below are the minutes of the first meeting and some details about Catherine Cookson, one of the founding members. 4. ACTIVITIES OF THE GROUP. 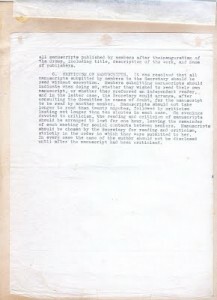 It was resolved, after considerable discussion, that the meetings of the Group should at first be devoted to criticism of manuscripts submitted by members for the purpose, the holding of competitions between members for the writing of stories, articles and other works, on a subject set in advance, and the arranging of addresses by members of the Group on subjects of interest to practising writers. it was not desired at first to invite outside lecturers, and consequently no separate subscription to the Group was fixed, as without this expense it was thought the the Group’s expenses would be small. Our programme has not changed significantly since the Group’s inauguration. 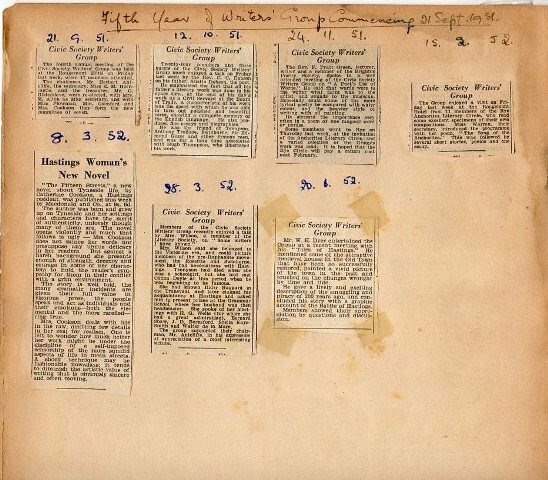 While 1947 lectures have developed into to modern workshops, the group still holds regular manuscript reading evenings and competitions. Catherine Cookson joined the Hastings Writers’ Circle in January 1948. 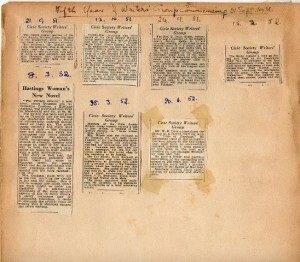 This newspaper cutting, pasted into the minute book, reports the publication of one of her early historical romances, The Fifteen Streets. “The Fifteen Streets”, a new novel about Tyneside life, by Catherine Cookson, a Hastings resident, was published this week by Macdonald and Co., at 9s. 6d. The author was born and grew up on Tyneside and her settings and characters have the merit of authenticity, unlovely though many of them are. The novel opens violently and much that follows is ugly – Mrs Cookson does not mince her words nor presuppose any undue delicacy in her readers. But against a harsh background she presents enough of strength, decency and courage in some of her characters to hold the reader’s sympathy for them in their conflict with a grim environment. The story is well told, the many dramatic incidents are given their full value in vigorous prose, the people speak and act as individuals and their emotions – both the elemental and the more rarefied – ring true. Mrs Cookson deals with life in the raw, omitting few details her zeal for realism. One is left to wonder how much better her work might be under the discipline of a self-imposed censorship of the more squalid aspects of life in mean streets. A shock technique may be fashionable nowadays; it tends to diminish the artistic value of writing that is obviously sincere and often moving. Read more about Catherine Cookson This link will take you to an external website for which Hastings Writers’ Group is not responsible.